Soccer Captains Chris Torres and Chandler Page pose for the camera after signing letters of intent to Bethel College in Kansas. After four consecutive years playing together on the same team, seniors Chandler Page and Chris Torres decided to make it eight, signing their letters of intent to Bethel College in North Newton, Kansas in a ceremony at the Jim Bateman Athletic Field House meeting room. Page and Torres, captains of the varsity soccer team their senior year, will represent Denton in the Kansas Collegiate Athletic Conference in NAIA. The two came to the decision together after it became opportunities at other schools were not going to offer as much in scholarships. 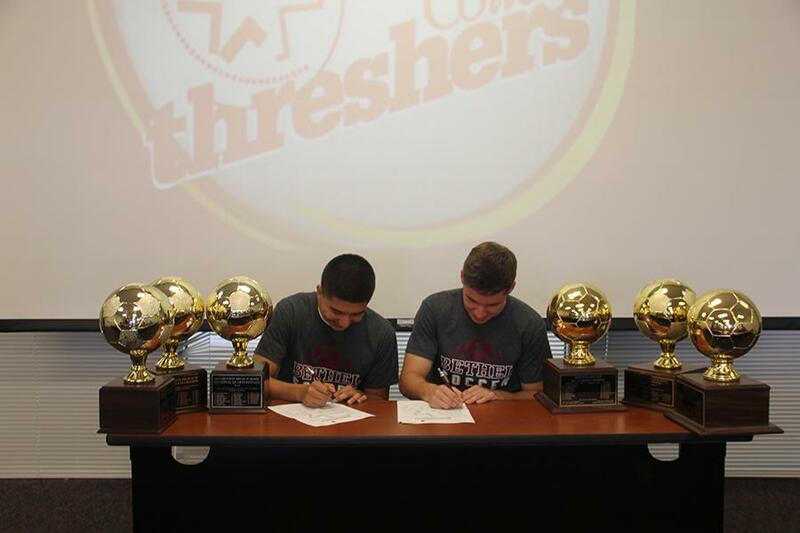 Soccer Captains Chris Torres and Chandler Page sign their letters of intent to Bethel College in Kansas. Senior Richard Szabo signed with a school in the same conference, McPherson College in nearby McPherson. The three signees all began their high school careers on JV as freshmen. After three playoff appearances and a district title, the pair feels ready for whatever comes next.